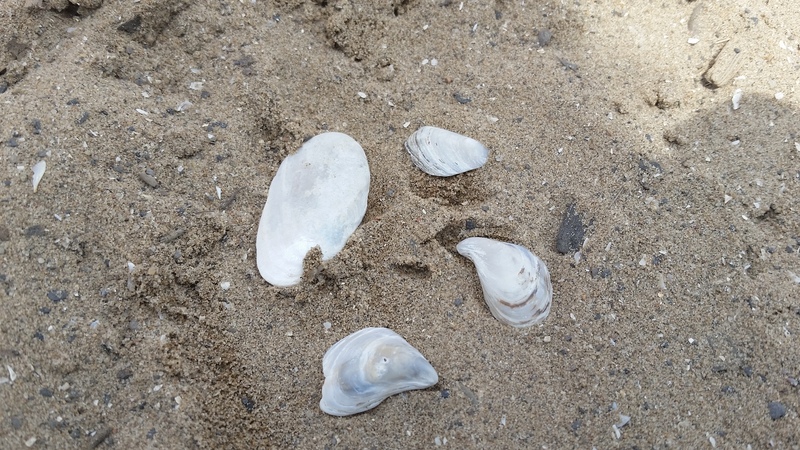 My daughter was introduced to shell and beach glass collecting! But since today ended up being a cold and much-needed rainy day, I started thinking about my next project– a new bottle tree. Unfortunately, the wind and rain of last fall brought my first bottle tree down with a great thud, and it was done for. So, I am sure you are wondering, what is a bottle tree?! For a truncated explanation, (you can read more about the history of bottle trees here at http://www.felderrushing.net/HistoryofBottleTrees.htm), bottle trees originated several centuries ago in Africa, and the idea was brought to the United States during slavery. 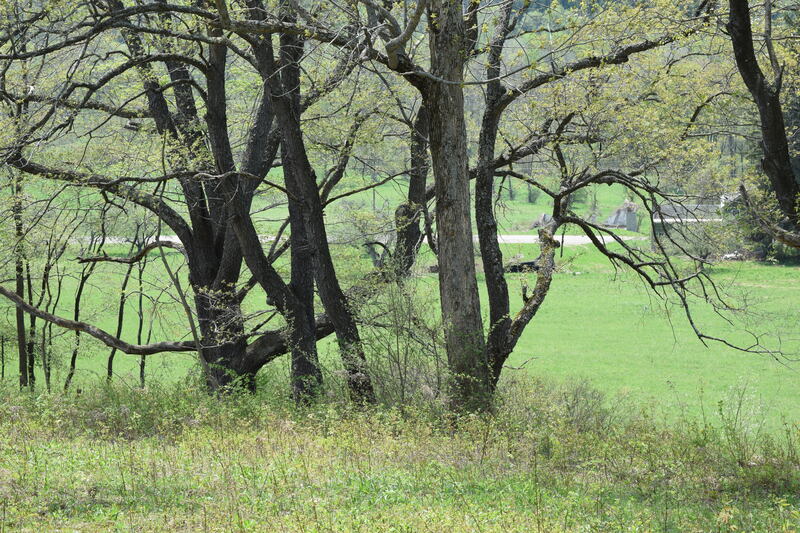 Bottle trees are very prominent in the Southern portion of the good ole’ USA. It is believed that the bottles that are hung on trees catch bad spirits. Now, they are primarily used as unique garden glass decor. This is a picture of one of my mother’s many bottle trees. Bottle trees can be expensive, but also very affordable to make, and that all depends on the avenue you choose to go down when it comes to just how fancy you would like it to be. My bottle tree, seeing better days. Now, there are several kits you can purchase online for $100 or up, but I suggest not purchasing those. I have heard from several people that most of those kits are metal bottle trees, and they tend to be very flimsy and don’t hold up very well. –Get a pressure treated 8ft. post from your local hardware, home store. They are about $12, but they will last longer than other non-treated posts. -If you don’t want to spend that much, buy a cedar fence post from your local lumber or farm store. That was what I used for my first bottle tree. It cost me $4. –I purchased a bag of gutter spikes that screw into the post. Purchase any sort of spike available at your local hardware store. If you get the spikes that screw in, get yourself a power drill and insert them in your post. They will not rot like the flimsy balsa wood dowels that I purchased for my first tree. They will last for a long time. -You can either shovel a hole for your tree or purchase a post hole digger. For the thrifty gardener, it might be more than you want to spend– about $25. If you would rather not go that way, just use the shovel. That what I use! –Use ANY bottle. You can buy colorful ones from discount stores, though I found my batch from the grocery store. Or, hit up friends and family, or save your wine bottles! I even used a colorful flower vase! 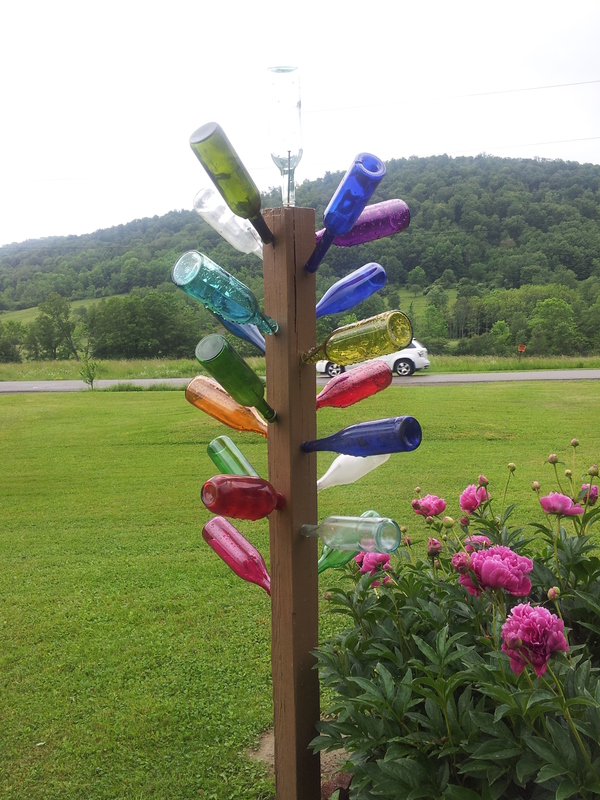 Bottle trees are meant to be creative, so go wild and have fun making one! They are a very unique addition to the garden! Stay tuned for pictures when I finally finish my second one! A walk in the park. Enjoy. I hope everyone had a wonderful Memorial Day weekend. Not only to get an extra day off from work, but to observe the meaning of the day– to honor those who have served or are serving to protect our freedom. It was a very busy weekend for my family, as I made sure my daughter got her nature fill! Going on nature walks, a trip to the aquarium and the beach, she couldn’t get enough! I promised myself since I had been working so hard in the garden the last two weekends, I was going to have fun. 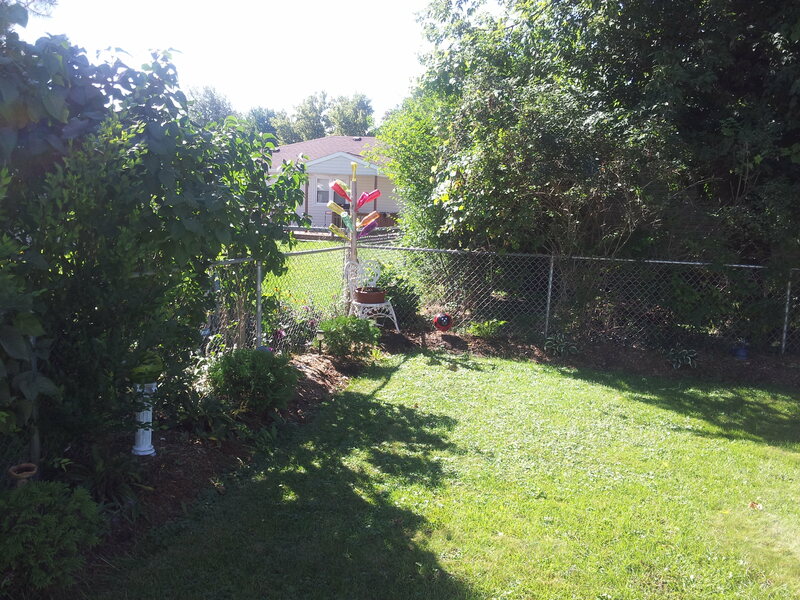 But then, my husband came up with a great idea for a little part of my yard that I was NOT happy with. The swing set last summer, right after we purchased it. My daughter’s swing set. There was this little square right underneath her slide that you can’t mow or really do anything with. My husband is terrified of our string trimmer, so that option is out. He suggested we actually make that little space into a flower bed! My twitter followers have already heard about my swing set flower bed, because I tweeted a picture immediately after I had finishing planting! What a brilliant idea! So, he worked up the soil for me and I purchased a flat of marigolds to put in there. I actually bought some red petunias too, but I kind of liked the idea of just having full-on marigolds. Presto! No more unsightly grass! So, why did I choose marigolds — why not something else? 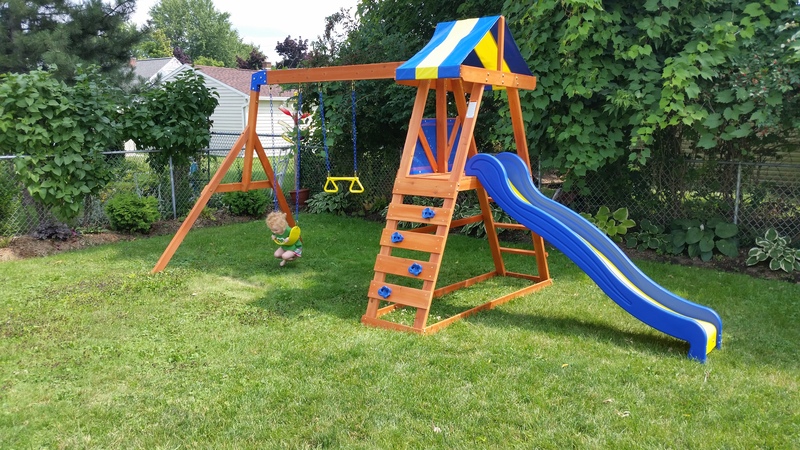 Well, I chose annuals because I know that someday this swing set will not longer be here (and I will cry), so when the day comes for it to be removed, we can easily just throw some grass seed over it and call it a day! 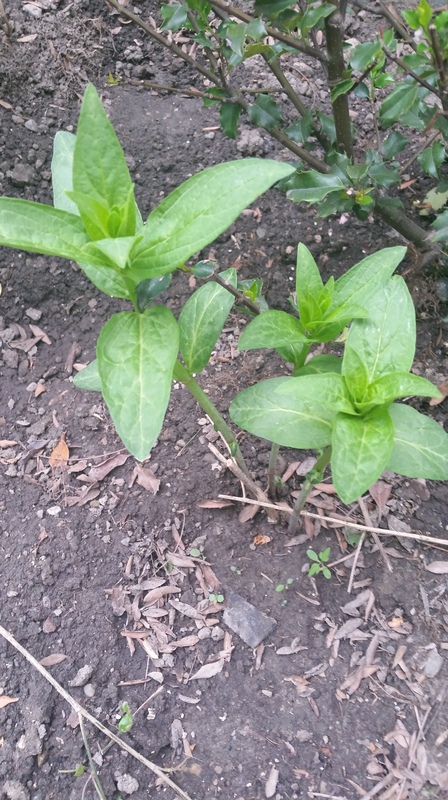 For me, planting a perennial would not make much sense. However, everybody is different, and may have a different way of looking at it. That’s what makes gardening so fun! -I want to also include a flower box on the side just to make it blend in with the rest of my landscaping. 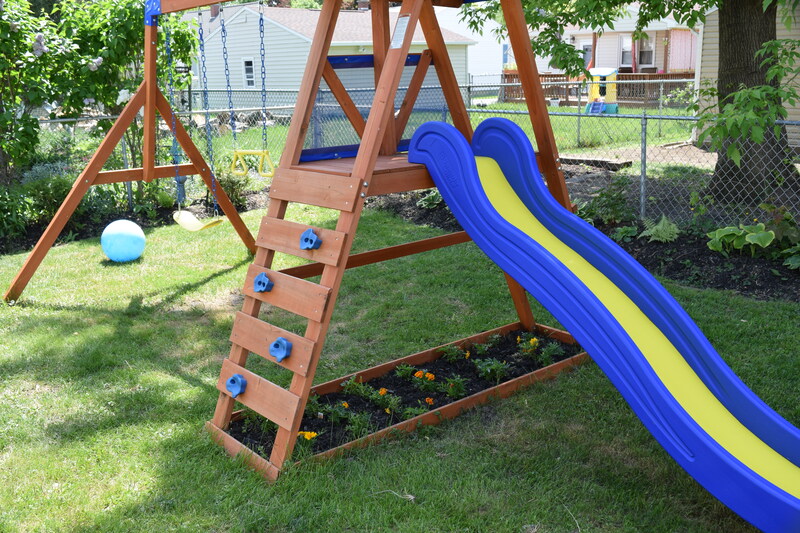 So don’t think of your swing sets as eye sores for your yard– think of them as just another creative touch to your landscape! Western New York had a record-breaking May so far! It’s the hottest ever, right after having the coldest winter ever! I went crazy this past weekend buying new plants and trying to get my beds in good shape. It’s spring time in Buffalo, and you take full advantage of the good weather, because before you know it, you will be hunkered down inside your house again! Time is going too fast, in my opinion! With these humid, 80-degree days, my flowers and plants are growing like crazy! I purchased a beautiful azalea to replace my dead arborvitae, and I bought another holly bush to compliment the one I have. There is also something else that I was thrilled to see come back this year, right next to my holly bushes– my swamp milkweed plant! Yes, last year when they were having a monarch butterfly exhibit at the Buffalo and Erie County Botanical Gardens, I took my daughter because she LOVES butterflies. She had a blast! While I was there, I learned a little bit more about Monarch Butterflies, and it made me a little sad. We are in danger of losing them if we don’t help the cause! Monarch Butterflies have been called the “King” of butterflies for their outstanding beauty. They lay their eggs on a plant called milkweed (they have also been called the “milkweed butterfly”). The larvae of the butterfly can ONLY eat milkweed. This is what helps them develop into caterpillars. Are poisonous, and so is the milkweed they feed off of. Many butterflies have evolved to mimic the look of a monarch, because predators know that Monarchs are poisonous due to their toxic diet of milkweed. Is considered invasive and a major problem for farmers. It has wreaked lots of havoc on crops, so farmers have been using pesticides to get rid of it. So, being as poisonous as they are, you would think there would be tons of monarchs flying around— guess again. Monarchs are very closed to be labeled “endangered” because billions of them are vanishing off the face of the earth. The main culprit? Well, it’s a combination of a lot of things. Climate change, yes, but the one that seems to be the most viable explanation is the use of pesticides. So many farmers use pesticides to kill the milkweed, that the butterflies are dying from the poison of the chemicals. Plant milkweed! Anywhere! In your gardens, in window boxes, everywhere! There is now a national campaign to plant as much milkweed as possible to get the monarch population back up to healthy numbers. Your milkweed plant does not have to flower in order to attract monarchs. The friendly gentlemen running the Monarch Butterfly exhibit last year explained that to us as I was perusing the milkweed plants. 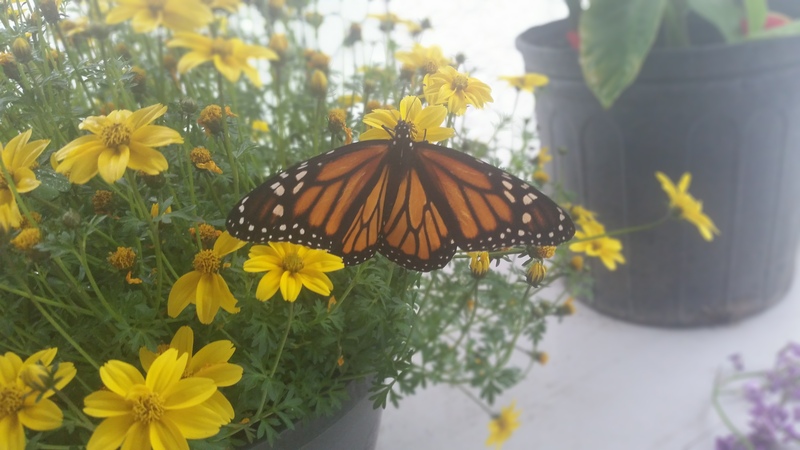 They are attracted to the plant in general, so flowering does not attract the monarchs on its own. My swamp milkweed is coming up just fine, and I am so happy that I can do my part, even if small, to help save the Monarch! I guess I have never been on a hike during this time of year. It’s either when everything is completely bare or full-on green. Seeing the little green sprouts on everything was absolutely beautiful to me, and I could help but take a picture. Enjoy. I hope everyone had a wonderful Mother’s Day weekend! 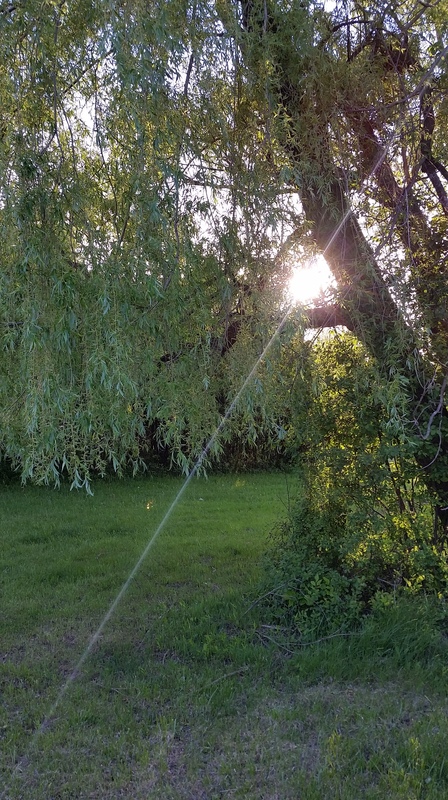 Western New York broke heat records this past weekend– 87 and 89 degrees! That little heat wave was exactly what all of the trees and plants needed. Green is bursting everywhere! 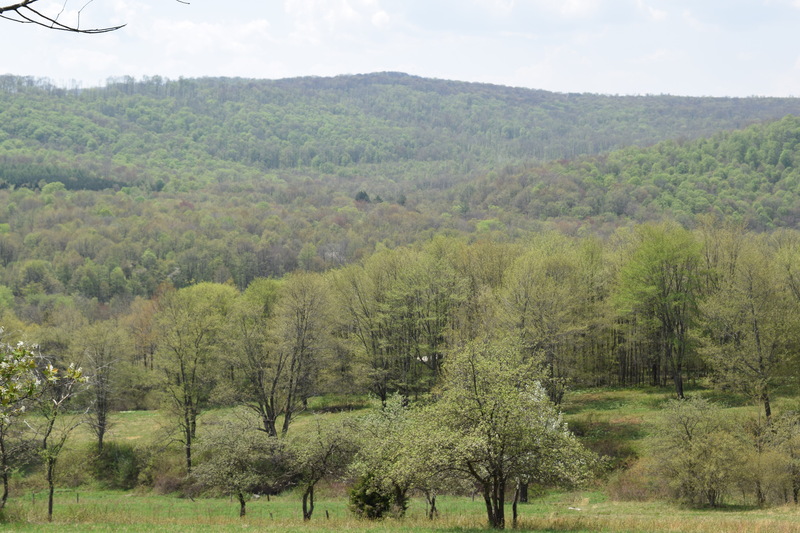 The hills at my childhood home are just speckled with green. It is beautiful! 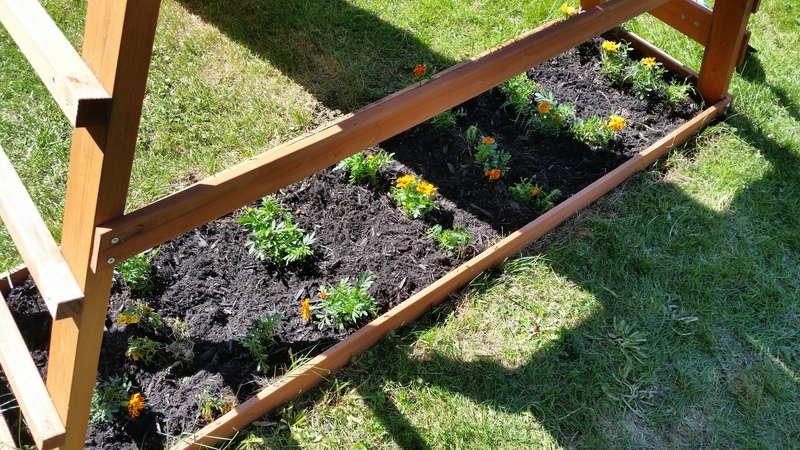 Not only did I spend the day at my parent’s house, but I also did some yard work the last half of the weekend– purchasing mulch and weeding, getting my flower beds ready. 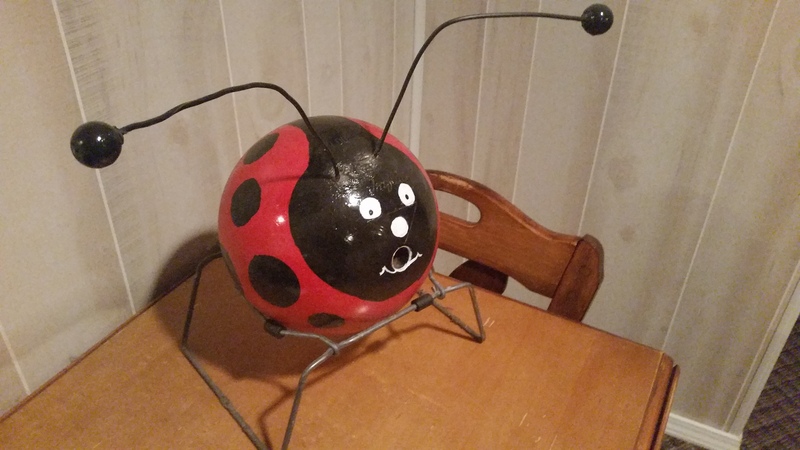 I started looking in my garage for some of my garden decor that I have collected over the years, and I started thinking about what a great series of posts it would be if I devoted some time to DIY garden decor– for cheap! We spend so much time fussing over our plants, flowers, shrubs, etc.– worrying about where we should move things, where they should be planted, that we don’t realize that there are other things we could use to boost our natural surroundings. First of all– What is Garden Decor? If you are making new flower beds and all of your plants are small. If you are creating new plant beds and you have a lot space, put a garden gnome or two in. It adds some pop to a young landscape. For this post, I am going to talk about bowling balls. I have to give my mother credit for this, and I am kind of addicted to them. They are a great alternative to the pricier garden globes that you can get at your local nursery. Now, you can buy garden globes, I have two. 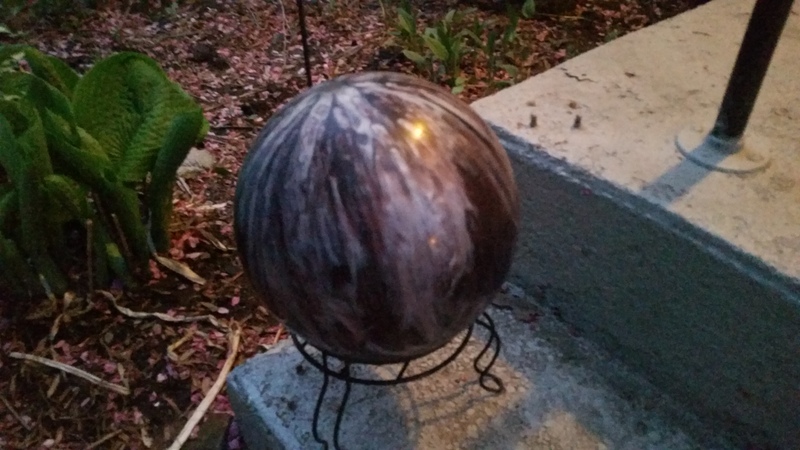 But, if you are like me, and spend $60 on a garden globe and then come home to find it smashed all over your driveway because an animal knocked it over, it really is a disappointment. So, why not visit your local thrift shop or garage sale, and pick up that old bowling ball with “Madge” etched into it? It will cost you less than $5 and there are so many pretty colors! This purple beauty has 5 finger holes! *You can do so many things with them! I purchased small plant stands and placed two different color bowling balls on them. They sit on my front steps. You can find a lot of patterns that show you how to paint bowling balls. 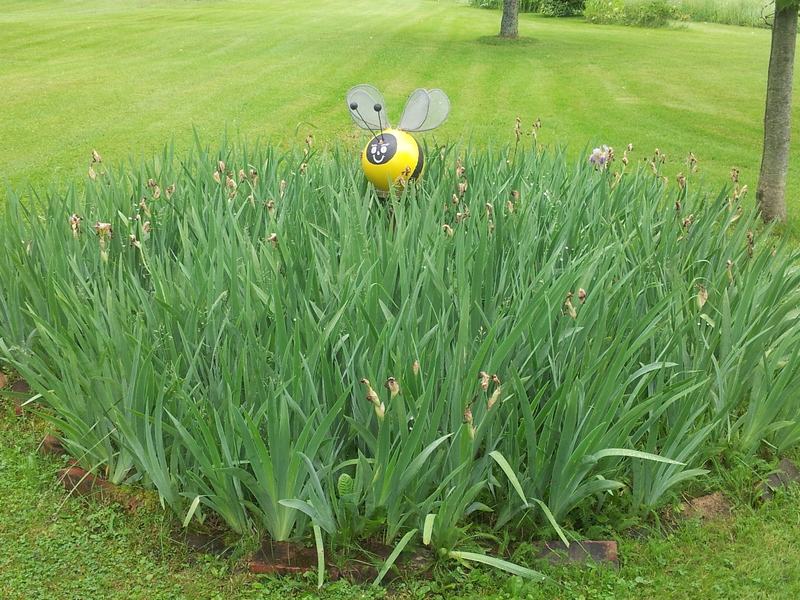 That’s one big bumblebee among the iris’! 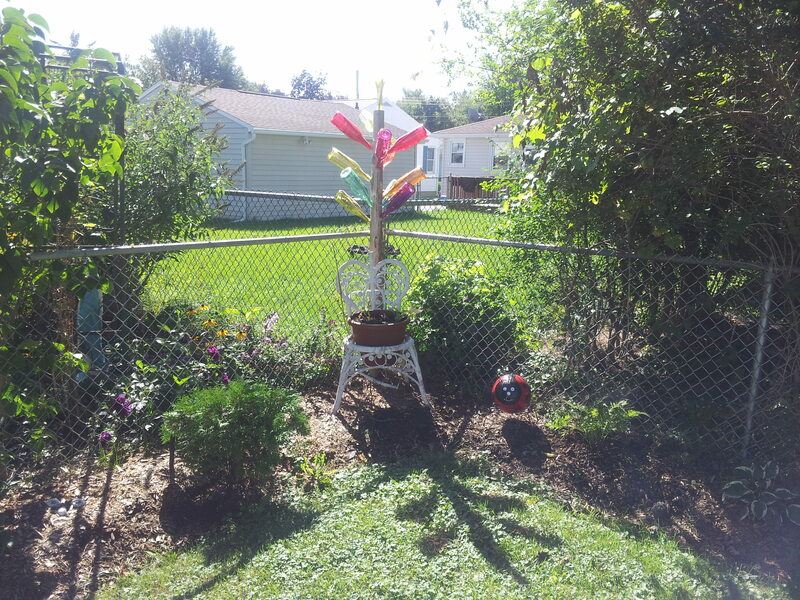 I also put a bowling ball on one of my garden globe pedestals and set it out in my bigger flower bed. There are so many things you can do with bowling balls that aren’t limited to what I have discussed above. This is where creativity comes into play. Taking everyday objects and making them into beautiful pieces of art is one of the most crafty things you can do. And for CHEAP. You don’t need to spend a lot of money to have anything look nice. It just takes a little elbow grease and creativity. And it means so much more to your gardens than you would ever think! One of the first things I saw growing in my back yard last weekend were these violets. 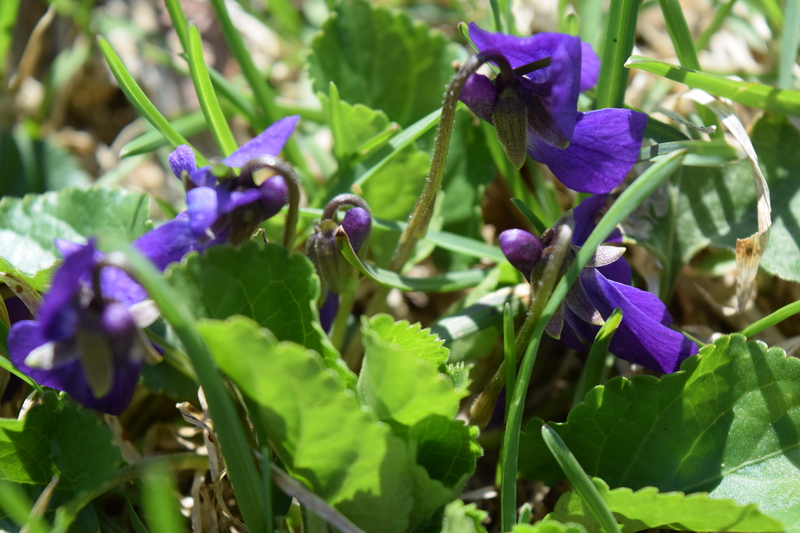 I know most people consider violets a weed, but I remember as a child growing up in a valley called Bucktooth Run, there was this little violet patch in the hay field behind my house. I loved it and took claim to it. Enjoy. Pretty much everyone in my neck of the woods became warriors this past weekend. The proof is in the sun-burned faces and foreheads that walked into work this morning! Yes, our first weekend of warm, sunny weather was here, and that meant everyone was ready to dig in to some much-needed yard work! I myself couldn’t wait to get out there and dig into the earth…well, what I had envisioned as earth, at least — wonderful, nutrient rich soil just waiting for me to sow and plant in it. Instead, I got a rough, dried, break apart and roll out of your hands soil that was begging for water. No matter, I did a little weeding, planted a few cosmos seeds and turned up as much of the “soil” as I could. And, I gave some much-needed water to everything! Soil is a mixture of minerals, decomposed plants, and rocks. It encompasses everything from Mulch to Chalk. Depending on where in the world you live, you will most likely have soil that has more of one mineral(s) than another. You might get lucky and get the perfect ratio of all the above, which is called Loam. Loam is the ideal growing medium for all plants. Gardeners work really hard to get their soil to loamy proportions. Playing with the pH of your soil helps achieve this. 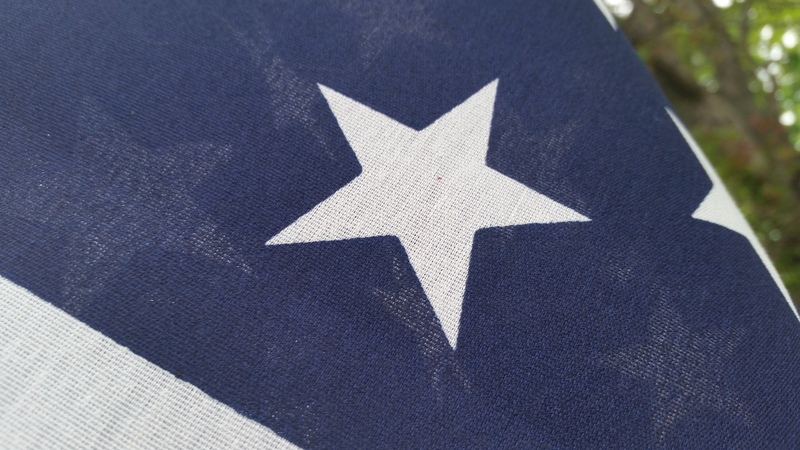 Silt — has a chalky feel, but is definitely easier to work with than clay. Because silt has mineral particles that are so fine, you can compact it easy and it holds water in. It’s a good mix between sand and clay. The downside is that because it holds water so well, it could hurt your plants by not getting enough air to the roots to dry them enough to grow. Sand — sand is made up of large mineral and rock particles. 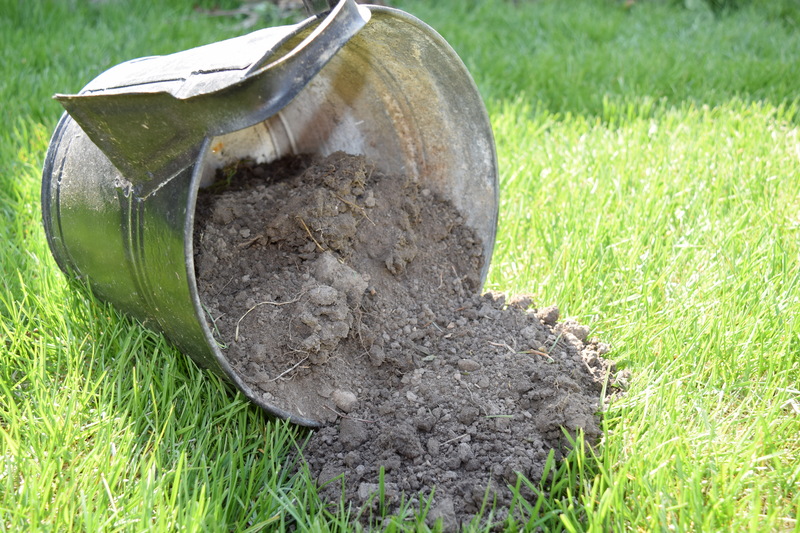 While it’s not the most desirable soil to plant in, all is not lost if this is the type of soil in your neighborhood. Cactus and other plants that survive drought-like conditions thrive in sand. You can add mulch to your soil if its sandy to keep moisture in, since sand does not hold water well.